It's been three months since my last empties post (here). I'm actually very surprised to be doing this post because I almost never finish up any products in such a semi-short period of time. It might be due to the fact that I was subconsciously trying to clear out some space in my collection to add some new bits into the mix. 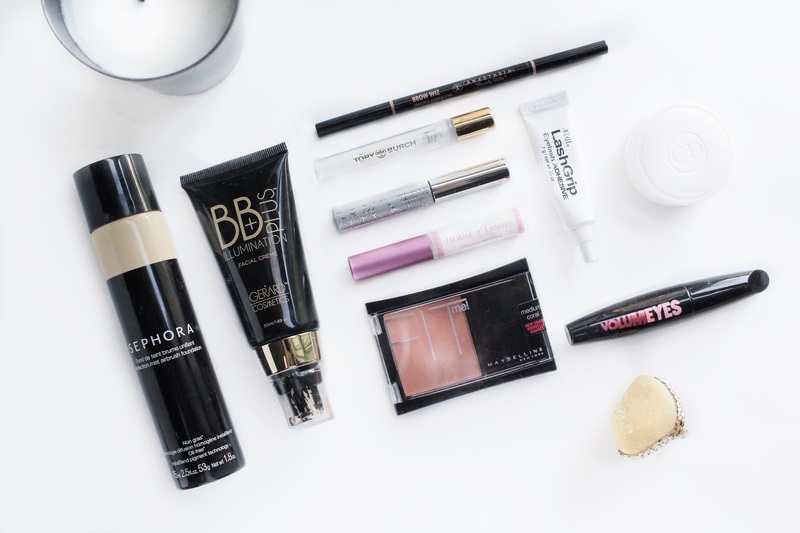 And what do ya know, the Sephora VIB sale rolled around and that's just what I did (but that's for another post!). Anyways, onto the main purpose of the post..
Sephora Perfection Mist Airbrush Foundation | I had no idea this was empty, but I reached for it the other day to do a quick makeup look and was disappointed to see that I had none left. I loved this though. It was an easy foundation to use when I needed to put a face on in record time. The coverage was light to medium, but it lasts pretty long and looks just like skin. Would I repurchase? Definitely. Clinique Bottom Lash Mascara | I've had this one for so long, I can't even remember when I purchased it. It was a good mascara and it made it easier to get to all those hard to get areas, like in the inner corners, but it's not really that necessary. If you have a regular mascara with a tapered wand, you could probably do the same thing. Would I repurchase? No. Anastasia Beverly Hills Brow Wiz | Everyone's favourite brow pencil, am I right? I'm pretty sure this is my third one. I go through these things like crazy! It's a really good one, however, I much prefer their Brow Definer or the NYX Micro Brow. Those compared to the Brow Wiz are much more creamier. I find that this one sometimes pulls my brow hairs (I'm sure nobody likes that). Would I repurchase? Maybe. If I can't get a hold of the other two pencils mentioned. Tory Burch Perfume (Deluxe Sample) | I actually just found this little guy sitting in my Muji Drawer the other day and sprayed the remaining around my room. I'm usually very picky with my scents, but this one I really get along with. Would I repurchase? Already purchased a rollerball! House of Lashes Eyelash Adhesive | Best lash glue ever! I love that it's not a squeeze tube because it's so much easier to apply with a wand. This stuff never fails me. Once my lashes are on, they don't move unless I want them to. One thing I didn't like though - if you get sloppy when putting the wand back, glue gets all around the opening and it's just a disaster. Would I repurchase? Yes! Already have and might need to buy some backups soon. Model Co. Volumeyes Mascara | I got this in an Ipsy bag a while ago. It's an ok mascara. I mean, it's really nice if you just do one or two coats. But if you have short (almost non-existent) lashes like me, you probably like to pile on coat after coat. I can't do that with this mascara because it just ends up clumpy, which is a look I cannot stand. Glad to have finished it up though. Would I repurchase? No. Simple Cleansing Facial Wipes* | Oops, I forgot to include this in the photo. I forgot the last time I used makeup wipes. I think it was two years ago when I bought it in bulk from Costco. Anyways, I found these wipes to be really good at taking off most of my makeup. It was really soft, unlike some wipes that are too rough on the skin. I felt refreshed whenever I used these. Would I repurchase? Maybe. Gerard Cosmetics BB+ Illumination Creme | Ugh, I've had this thing for so long and never really used it. I used it mixed in with foundation before, but it did not look good at all. This is one of the products YouTubers swayed me to purchase. I did not see what the big deal was with this one. Anyways, I found it while cleaning out my stash the other day and decided to swatch it. Upon squeezing some out, it had an odd smell so I decided it was time to throw away. Would I repurchase? Never. Maybelline Fit Me Blush in Medium Coral | I bought this a while ago and thought it was a really pretty blush at the time. Again, while cleaning out my collection, I swatched this and there was absolutely no product showing up. Like at all! I was rubbing as hard as I could but nada! Definite toss out. Would I repurchase? Probably not. Ardell LashGrip Eyelash Adhesive | Is this the same as the Duo glue? I really have no idea. Anyways, I think I got the one that turns dark and I hated it. I don't like wearing eyeliner all the time, but I do like to wear false lashes. This did nothing in terms of making the lashes look natural. Would I repurchase? Nope. How many products do you go through in a month?